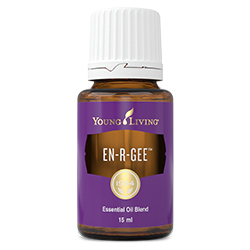 Fresh and herbaceous, En-R-Gee essential oil blend offers an invigorating aromatic boost when you need it most. Diffuse or apply it topically during your morning routine or before any activity to enjoy its stimulating, spicy fragrance. En-R-Gee contains the naturally occurring constituents alpha-pinene, eucalyptol, camphor, myristicin, and geranial. When used, it can be energising, revitalising, uplifting, and rejuvenating. Containing naturally energising essential oils such as nutmeg, black pepper, rosemary, and clove, En-R-Gee may increase mental alertness and enhance energy and mental clarity. Dilute and apply to ears, wrists, neck, temples, or feet to inspire feelings of support and to help release feelings of separation and isolation. Complementary essential oil blends include: Awaken, Clarity, EndoFlex, Brain Power, Joy, and Citrus Fresh. Dilute and apply En-R-Gee to your ears, wrists, neck, temples, or feet as a replacement for your morning coffee. Combine with Clarity™ essential oil blend and diffuse during late-night study sessions for an invigorating and motivating aroma that may help you stay focused. Add a couple drops to V-6™ Enhanced Vegetable Oil Complex and massage into temples, bottoms of feet, or back of neck before a challenging activity for an exhilarating fragrance. Rosemary (Rosmarinus officinalis) leaf oil †, Juniper (Juniperus osteosperma) oil †, Lemongrass (Cymbopogon flexuosus) oil †, Nutmeg (Myristica fragrans) kernel oil †, Balsam Canada (Abies balsamea) needle oil †, Clove (Eugenia caryophyllus) bud oil †, Black pepper (Piper nigrum) fruit oil †.